Sometimes we get so excited about what activity we’re going to do with our students we jump in to the game or pattern without giving much time to actually practicing the skill first. In this post I want to review the different between practicing the skill and using the skill in an activity, because some riders really need to do the one before the other! Is a simple practice of the skill, without worry/distraction by props or patterns, that sets the rider up well to participate in the activity or game. Some riders need time to learn a skill before applying it in a more complicated situation such as a pattern or game. So practicing it on the wall or at a halt first will help them learn the muscle memory before going on to something harder or multi-tasking. 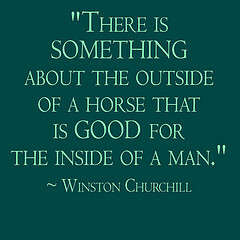 But not all riders need much practice. A more experienced rider can go straight to practicing the skill in the pattern (ex: quickly review steering, then go straight performing steering through serpentines). Right after teaching the skill, give them some time to practice the skill before moving on to using the skill in a pattern or activity. Incorporates other life skills – memory, competitive skills, social interactions, etc. Plan for what obstacles/props you need, and set up the arena before the lesson. If during the lesson you realize you forgot something, don’t leave the arena to get it, but ask a volunteer to get it. Direct them how to begin – who goes first? One at a time? Follow the leader? How much assistance is needed? I hope that helps clarify things! By no means is this THE RULE, just some helpful tips of what I’ve been leaning. 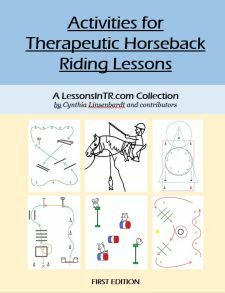 The point I want to make is that we need to give our riders time to grasp the riding skill before engaging them in an activity that could potentially inhibit their learning. For example, if you teach a new rider to halt, then immediate have him practice by halting by the T pole to collect the rings, he may get so distracted by the rings he forgets to halt, or leans toward the rings while halting, or something else that throws off his posture or correct use of the skill, because he hasn’t established understanding the correct use of the skill yet (this happened to me!). However, once he understand correct use of the skill by practicing halting at several letters, then he is ready to use the skill to halt by the pole to get the ring – which at this point might give him good motivation for stopping if the letters have started to get boring. Have a great week of teaching!